We’ve had this blog going for a few months now and the response has been great – almost 10,000 views from over 50 countries! Thanks for being so interested in our ramblings, musings and images. To show gratitude to our readers, we’d like to welcome spring with our first giveaway. Everybody loves beautiful weather, budding life and free stuff. The prize is our little book, “Finding Home” (uncoincidentally the name of this blog ). It’s a limited edition book we self-published a few years ago for our clients and friends. In its pages lie some of Bobby McAlpine’s poetry (which has been the focus of two posts on this blog) and sepia portraits of a bit of our work. We’ve only a handful of these gems left and we’d like to make one of the last copies available to one of our readers. To make the win even sweeter, the book will be personally autographed by Bobby. For a chance at the prize, leave a comment, we’ll put the names in a stylish container and draw a winner. The contest is open for one week. Good luck and no pushing. Love your blog!! And want that book!! I would love to have a copy of this beautiful book! Oh… I would LOVE to win a copy!! I’m pushing for the book! Great blog. Looks like a lovely little book! Please pick me. I would cherish it always. long time admirer (ok, stalker) of your work. would be honored to add this to my collection. I would love to add this book to my library. Thank you for the opportunity! I am a long time follower of your beautiful work and would adore this book on my coffee table. Oh my! 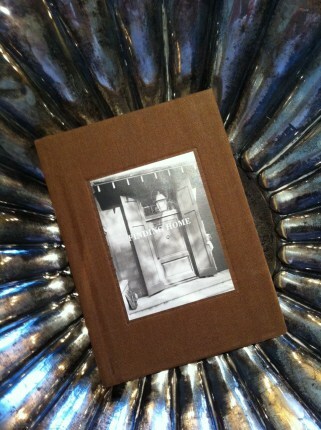 How I would love to win a copy of your limited edition book “Finding Home.” I am moved by your words and educated eye. Thanks for the opportunity! Great book from a great group of designers! Would love to own this book of work by such a talented group. Fingers crossed! I continually wait for your blogs. I hope to catch glimpses into some of the the interiors and marvel at the exteriors that the architectural firm and design firm produce. Man, what I wouldn’t give to have a copy. Now if I can just figure out how to dog-ear this entry so you’ll be sure to draw it, I’ll be in business. Man, what I wouldn’t give to have a copy. Now, if I could just figure out how to dog-ear this entry so that you’ll be sure to draw it, I’ll be business. What a wonderful thing to do. Giveaways are always fun, and you obviously get to see plenty of more comments. Thanks for taking the time to blog, and share a little bit more of your world with us. Cheers! I would love to have a copy of this book!!!! This book will have a great home if I win it and will be read with a hearty appreciation!!! I think it may be my lucky day!!! Your number one fan at the beach! Thank you for the opportunity of being selected to receive this book! thank-you for your unending inspiration…. I would love a copy of ‘Finding Home’ ! I would love this book, and I’d be extra careful not to drool on it. In the novel IRELAND, a child described The architect of Newgrange as “one who causes buildings.” (I loved that line. )This one, Bobby McAlpine, does that, and more. He “causes” beauty…in myriad ways. My artistic dream is to work with this master. I’ve a passion for my stone house but it hasn’t been expressed to it’s fullness…Nor has my purse been stretched to it’s depths. For now, a wee book would please and inspire me. Hope this will “cause” me to win it! I would be very honored to have a copy of this book. what a treasure this would be! Even though I am British (but live in USA), I would be prepared to ‘push’ and maybe ‘shove’ for this book! Love your blog and all the thoughtful content. So inspiring! Love this blog…. would love to win the book! Love this blog! I look forward to each and every post. Your work and words are always so inspiring! Having a copy of Finding Home would be wonderful!! Love, love Bobby’s work! Am lucky enough to have a few friends who live in his houses so I’m constantly going over to steal inspiration! I hope I win ! I’m your biggest fan! Great giveaway and it would be perfect in my living room for guests to see! I love this blog! Love the words, the images, all of it. Would love to have the book, too! I am a huge fan of your work, and would love to have this book! I am a huge fan of your work and would love to have this book! gimme. gimme the book, Greg! Sounds wonderful! I would love to have a copy for my library! .thank you for your continual inspiration. I always enjoy this blog. And yes I would love the book! Yes please! I would love to enter! I’d love to win this book! And thank you so much for your kind comment on my blog today – I was glad to spread the word – I can’t say enough good things about your amazing work! How did I not know that y’all have a blog? Put my name in the hat! Look forward to seeing more of the blog! Put my name in that stylish container now! I’d love to have the opportunity to read your little book. Fantastic and thought provoking book Mr. McAlpine! Love seeing your work here in Louisiana. Your work inspires me to keep sketching, thinking, meditating and dreaming for my clients. Thank you for sharing your talents to the world. Peace! Ohh I would just die to have this book! I have been a HUGE fan of Bobby’s for years, specifically interning with people I knew he had worked with in hopes of gaining the knowledge they had through their particular collaborations. He has been, without a doubt, the biggest influence on my interior designing to date and the reason I still do my drawings by hand (eventhough it meant double the work in college because I had to show that I could do it all on CAD as well! Explaining it to my professors was always fun…’but I think the drawings are so beautiful’ when all they wanted to tell me was how inefficient it was… All I would say is that Bobby could manage to do it that way and therefore it could be done!) Now that I live in Australia I have told people traveling to High Point that they HAVE to see your furniture, or they will have missed a huge highlight of the show. I am, without a doubt, one of your biggest fans and would just LOVE to have this book. Even if I don’t win I’d love to know how I can get one of the last copies! Your style and scale are timeless and comfortable. Beautiful work and such inspiration! I too hand draw most of my work and I was so glad to find out your office still proudly relies on hand drawings. Even the best of computer drawings fail to capture the essence of a good building design. I love to look at photos of your works. You have an unmatched style. Particularly, I love your “indirect” entrances. You create elements that say “come this way to the entrance”. It’s just around the bend without glaring at you first thing. I work as the communications chair with the TN chapter of the Institute of Classical Architecture and Art. Bobby spoke at our annual meeting in 2010 in Nashville. His eloquent speaking and of course the architecture was inspirational. I was low on funds (happens all too frequently) and therefore didn’t buy the book at the time. Here’s a chance to get it after all. Needless to say, I would love to have a copy. Thank you. A dear friend introduced me to your work. I would love to win this for him. Thanks much. amazing book. would love to have a copy of my own! Bobby, we’ve never met but you and your team have truly inspired me over the years to be a better designer- not to mimic but to really think about architecture and client relationships in a new and more productive way. I wish you many many more years of success! Our daughter, Virginia, dressed up as a ghost and stood on a newell post for your first book! She’s now 23 and would really love a copy!! We’ve always been huge fans of the McAlpine Tankersley group!! Inspiring portfolio … your book would be a wonderful addition to our home. would be so happy to own this book. thank you for your constant inspiration and true love of home! I am enjoying your ramblings and musings. I find I end up quoting Bobby often…like designing an “inheritable house”. I also find your homes quiet and calming; truly a wonderful place to come home to. So glad I found this inspiring blog. Love all the work done by this team! Hi, I would love this beautiful book. Love everything about the new blog! You’ve done a great job of continuing to move forward with the same inspirational bent. I would love this book in my library! I will hold my breath.